El Captain, a vertical rock formation in Yosemite Valley, has fascinated potential rock climbers since the sport started gaining traction. Rock climber Warren Harding made history in 1958 when he, along with Wayne Merry and George Whitmore, ascended the cliff over the course of forty-seven days. They accomplished this by employing fixed manila ropes. Though they would occasionally break due to the cold temperature, they persevered and made history. Over the next decades, more climbers would conquer this cliff. Royal Ribbons was the first to ascend the mountainside solo while Beverly Johnson would be the first woman to accomplish the task. In the year 2017, a climber named Alex Honnold seeks to accomplish something nigh-unthinkable – to complete the first free solo climb of El Captian. That is to say, he is to ascend 3,000 feet (915 meters) of granite alone and without the use of ropes, harnesses, or any kind protective equipment. Knowing the consequences, he gathers a crew determined to capture this piece of history on film. Alex Honnold has had a fascination with rock climbing ever since he was five. By age ten, he would climb the rock wall at a local gym many times a week. Though he admitted that many other kids were better than him at climbing, he never gave up this passion. After graduating from high school in 2003, he enrolled at the University of California in Berkeley. During his first year, his maternal grandfather died and his parents divorced. He admitted he never met or spoke to anybody during his time there, preferring to skip classes in order to boulder alone at Indian Rock. As a result of his general disinterest, he dropped out of college in 2004. In 2007, he would make national news when he free soloed Yosemite Park’s Astroman and the Rostrum in the span of one day, thereby matching climber Peter Croft’s 1987 feat. In 2010, he was awarded the Golden Piton for his achievements. Five years later, he received the Piolets d’Or, a mountaineering award handed out by the French magazine Montagnes. He received this award for having fully traversed the Fitz Roy Range in Patagonia, Argentina. From the beginning, Mr. Honnold is shown to be a peculiar individual. Before finding a girlfriend, he is perfectly content living in a large van, feeling it helps him with his climbing activities. It stands to reason; attempting to climb mountains without any safety equipment would require a kind of fearlessness a typical person doesn’t possess. After all, even the slightest bit of hesitation would result in the climber’s untimely death. He is also somewhat reckless. There is one point in which he sprains his ankle during one of his test climbs and, against the doctor’s advice, is seen attempting to climb an indoor rock wall in the very next cut. As if to remove any doubt from the audience, Mr. Honnold eventually undergoes a CAT scan. Unsurprisingly, the amygdala, the section of the brain that activates in response to threats and causes the person to feel fear doesn’t light up on the scan. Usually, when a documentary focuses on a subject who is attempting a death-defying stunt, the filmmakers tend to romanticize them. In this film, you’re just as likely to question Mr. Honnold’s mental stability as much as you are to stare in awe at his free solo attempts. What I particularly admire about Free Solo is that it doesn’t downplay the involvement of Mr. Honnold’s crew. Due to their very nature, many documentaries involve the director talking directly to their audience. In this regard, co-director Jimmy Chin’s role in the narrative is quite unusual. He, along with the unseen Elizabeth Chai Vasarhelyi, is obviously not the main focus, yet he is every bit as important to the project as Mr. Honnold. Though he’s not the one risking his life, he is brave for wanting to collaborate on this project. He even points out that he could, at any moment, record Mr. Honnold’s final moments as a slight miscalculation causes him to fall right out of the frame. Depending on how it goes, what he is shooting would either capture one of the single greatest physical accomplishments of the twenty-first century or transform into a snuff film. There’s no in between either. As Mr. Honnold himself puts it, what he is doing is like being in the Olympics and if you don’t get the gold medal, you die. 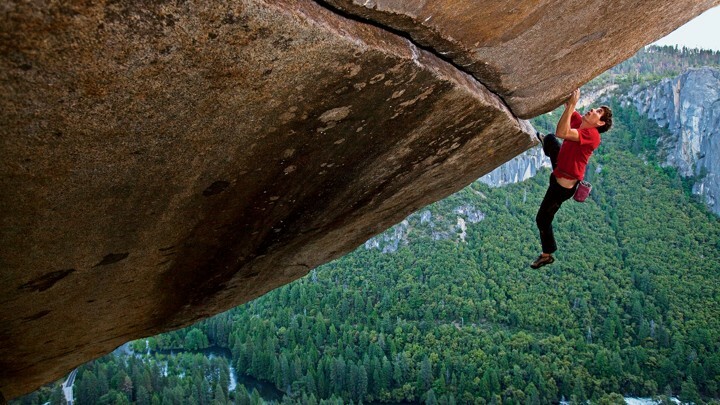 Indeed, Free Solo is very detailed when it comes to showing just how dangerous Mr. Honnold’s undertaking is. As with all of his free soloing attempts, he maps out the mountainside before attempting to climb it. In order to make it past the pitches, he has to, among other things, climb down for a significant length of time and squeeze into a narrow crevice with barely any room to move. The sheer amount of memorization he must do is astonishing, and even the slightest wrong motion will cause him to fall. Fittingly, there are two alternate paths he could take to get to the top, and both present countless difficulties. His choice is between scaling a glasslike surface and a ragged one in which he must contort his body in very specific ways. To truly underscore the stakes, the film pays tribute to other climbers who lost their lives in their free solo attempts. Notably, one is shown actually falling from the cliff. 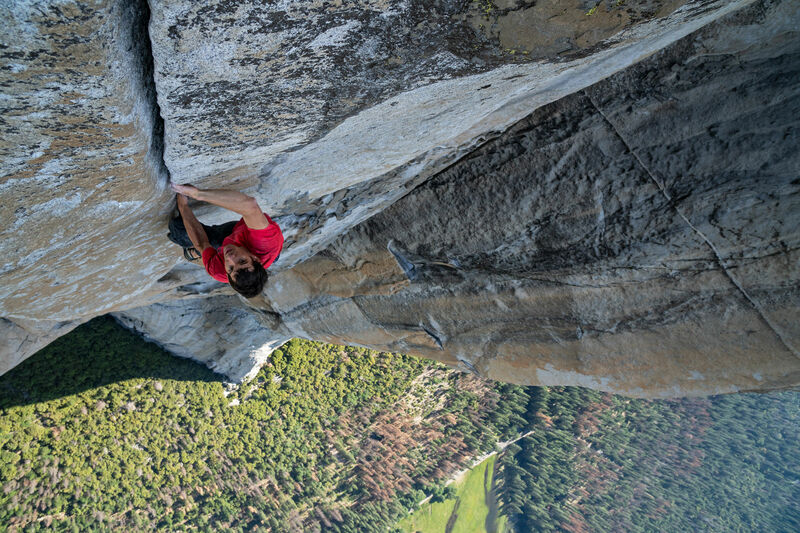 Even after having seen many films in theaters, I rarely ever hear the audience gasp in unison, but Free Solo managed to do it. It is something of a bait-and-switch because the climber in question, Dean Potter, is revealed to have attempted a BASE jump when he deploys his parachute. However, it turns out he too lost his life. In his case, he attempted an illegal proximity wingsuit flight in Yosemite and crashed, dying upon impact. It has been argued that the middle portions of the film cause the pacing to come to a screeching halt. On some level, I agree because a lot of these segments, which includes Mr. Honnold buying a house and a refrigerator, could be construed as padding. However, I ultimately counter that they were entirely necessary in order to establish who the subject is, why the audience should care about this stunt, and exactly what makes his attempt so daring. It’s even pointed out that the experts are the ones truly freaking out over what he is setting out to do. By the end, you will grasp that you just saw history in the making – even if you’re not an expert on the subject. 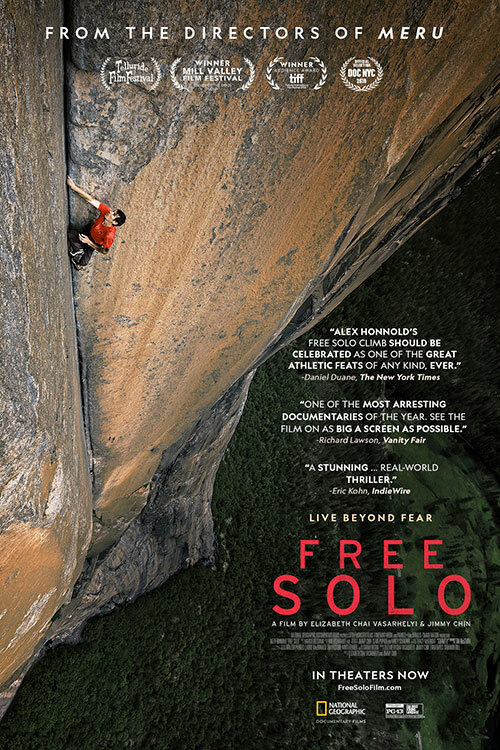 Free Solo is one of the best documentaries I’ve seen. It’s an incredible achievement in filmmaking when you consider how Mr. Chin had to record Mr. Honnold’s climb as it was occurring. Getting sound from the climber proved especially difficult because he was often too far away from the camera for his voice to be picked up by the microphone. This was not a project for the faint of heart, and everyone involved pulled through magnificently. I especially enjoyed getting to see this film in theaters because it makes you feel as though you’re along for the ride as well. It’s to the point where one could easily feel as though they’re in danger of plummeting as they’re watching. However, even watching it at home, I don’t think you could go wrong. Mr. Honnold’s brave, if decidedly insane journey is one that deserves to be seen regardless of the format you choose or where you may be.